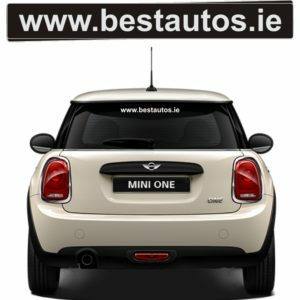 Window Stickers promote your dealership on the road, in the car park and just about everywhere. This high impact sticker is the primary brand barer for your vehicles once they leave your forecourt. It comes in a range of different sizes and shapes & printing is available in up to full colour. Need something designed? Our in house design team will help you every step of the way to achieve a look and product that is right for you. If you have your own design you can send it to us by using the tools tab or email sales@adva.ie. Need an instant quote? you can call us on 025-31212 or use the live chat function. External Stickers promote your dealership on the road, in the car park and just about everywhere. This high impact sticker is the primary brand bearer for your vehicles once they leave your forecourt. It comes in a range of different sizes and shapes & printing is available up to full colour. 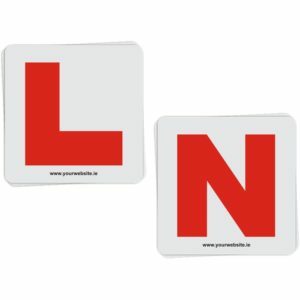 Learner and Novice plates are a must have for new drivers and are manufactured to RSA guidelines. This product is available as a reverse window sticker for application inside the car and also as a external sticker for application outside the car. This product can be purchased in individual sets (2) or as a bulk item for driving schools and resellers. It can be customized to include a website promotion or driver school details as illustrated in the image. Machinery Stickers promote your dealership on the road, while the machine is at work and just about everywhere. 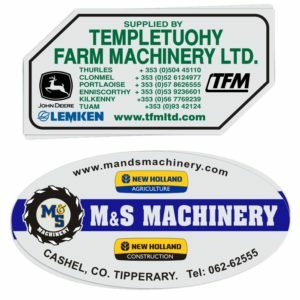 This high impact sticker is the primary brand bearer for your machinery long after it has been sold. It comes in a range of different sizes and shapes & printing is available up to full colour. Number Plate surround stickers are a cheap & effective form of advertising for your dealership. 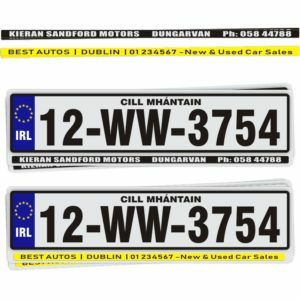 These durable stickers offer a perfect solution to advertise on the cars you sell without the expense of purchasing new number plate surrounds for every car. They are completely customizable to suit different types of number plates & design preferences. 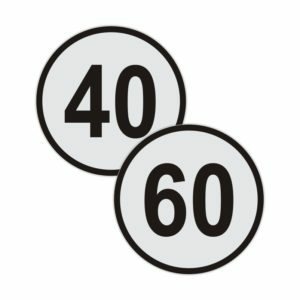 Speed Limit Stickers can be applied to a variety of vehicles which are limited to a certain speed. Speed Limit Stickers are ideal for vans, lorries ( HGV ), trucks, buses, caravans & construction vehicles plus many more other vehicles. They are used to inform other motorists that a vehicle has a speed control limit. 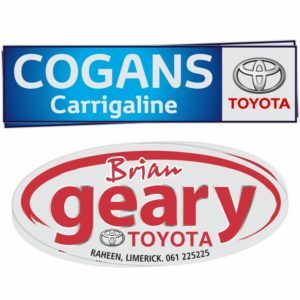 All stickers are made using high quality external grade vinyl which are suitable for vehicles. It is available at 30kph, 40kph, 50kph, 60kph, 70kph & 80kph. This product is available in individual sets (2) or as a bulk item for vehicle suppliers. 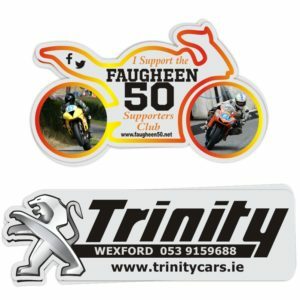 Website Display Stickers promote your dealership on the road, in car park and just about everywhere. This high impact sticker has become more popular in recent years due to the increased use of window tinting on vehicles. This product comes in two options, cut vinyl (Single Letters) or printed on a strip of clear film. Quotations for both options are available on request. Popular colours are white & silver but this can be designed to suit your branding and requirements.